Enjoy precise push button digital temperature and time control with this professional-grade smoker from Bass Pro Shops®. 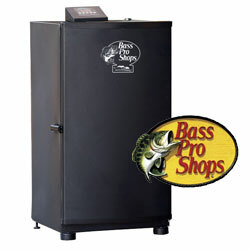 The Bass Pro Shops Electric Smokehouse Smoker features a digital thermostat-controlled heating element that adjusts up to 275º for even consistent cooking. Four removable smoking racks in 1.7 cubic feet of cooking space give you lots of room to smoke large quantities of food. Powder coated steel outer construction surround insulated walls for a cool-touch exterior. Automatic shut off prevents overheating. Intelligent design includes side loading wood chip holder, removable drip pan, rear-mounted grease pan, and top air damper to make smoking easier. 730.11 square inches of cooking surface.